Twelfth Annual Books and Basketball returns to South L.A. 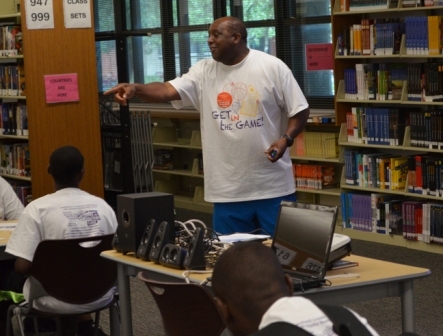 The 12th Annual Brotherhood Crusade Jim Cleamons Books and Basketball Camp will take place August 1 through August 5 at Augustus Hawkins High School, 825 West 60th Street, Los Angeles, CA 90037. Books and Basketball will provide one hundred 9-15 year old youths an opportunity to mix academics with athletics, learning math and science, financial education, social and personal life skills, health and nutrition tips, therapeutic chess, yoga, and of course, basketball. Former assistant New York Knicks Coach Jim Cleamons, a wealth of former NBA players, and a cadre of inspiring keynote speakers and guests will be part of the festivities this year. This year’s Books and Basketball Camp features daily hands-on science experiments taught by the California Science Center and financial education taught by Chase, life skills taught by Common Cents Development Corporation and Bobby Porter, and interactive chess taught by Chess Tutors. Camp participants will be treated to an all-star line-up of coaches including basketball legends Aaron James, Ricky Sobers, Bobby Porter, Bobbie Porter, Jr., Jasmine Porter, Travis Sobers, Brian Wright, Dion Wright, Jr., Sherrie Sessions, Caroline Dawson, La Sandra Dixon, Taelor Bakewell, Dr. Diandra Bremond, James Jones and, of course, Coach Jim Cleamons. “It’s the Network!! !” said ABA/NBA legend and camp co-founder James Jones. “I know it sounds like a cliché, but Brotherhood Crusade has assembled strong and dedicated community partners like CAM, Toyota, The Gas Company, Wells Fargo, The California Endowment, Bank of America, State Farm Insurance, Microsoft, Nielsen, Southern Cali­fornia Edison, Frontier Commun­ications, Southwest Air­lines, California Science Center, Verizon, AEG, Enterprise Holdings, MUFG Union Bank, US Soccer Foundation, California Community Foundation, American Honda Motor Company, Inc., Los Angeles Sentinel News­paper, American Airlines, City of Los Angeles GRYD, Ralphs, Comerica Bank, SEIU 2015, Ivie, McNeill & Wyatt, Xerox, UDW, 3090 AFSCME, Supervisor Mark Ridley Thomas, Councilman Curren Price and Councilmember Mar­queece Harris Dawson. To make a contribution to the Brotherhood Crusade, send a tax-deductible gift to: Brotherhood Crusade 200 East Slauson Avenue Los Angeles, CA 90011. please call (323) 846-1649 www.brotherhoodcrusade.org or www.facebook.com/ bcrusade.